Let’s answer the question, is Vitamin C an Antioxidant or a Pro-oxidant? The answer is yes and yes. The environment dictates the effects of vitamin C. In the right environment, vitamin C can be a pro-oxidant; equally, in the right environment, the same vitamin C can be an antioxidant. This is the third article of a seven-part series by Nathan Goodyear, MD at An Oasis of Healing on the evidence and research on Vitamin C therapy for Cancer. If you missed the first two articles, you can go here for the first article and then here for the second to get caught up and read them in full. It comes down to the redox potential. Redox is the balance of the ability to oxidize versus the ability to reduce. Breakdown the word redox: red- is the ability to reduce and -ox is the ability to oxidize. The reduction ability is equivalent to the anti-oxidant and the oxidation ability is equivalent to the pro-oxidant. What is a pro-oxidant? A pro-oxidant is something that is simply pro oxidation Rust is a good example of the oxidative process. Picture your dream car. Now picture that beautiful, shiny car just off the showroom floor in your driveway. The sun just glistens off the polished, new paint on the body of the car. The body of the car is smooth and in pristine condition without a scratch or blemish. Put the key in the ignition and turn to hear the crisp, clear ignition and the gentle hum of the engine. Push the gas pedal and feel the horsepower take over. There is no delay. There is no dysfunction. That is the lack of the presence of oxidation. A pro-oxidant is synonymous with anything that is oxidative. The oxidative process is the cause of stress to the cell, thus the term oxidative stress. Oxidative stress is the result of Reactive Oxygen Species (ROS). Reactive Oxygen species are oxidative species i.e. hydrogen peroxide (H2O2), hydroxyl free radicals (OH−), and superoxide anions (·O2−), that react with cell components to create stress to the cell and if unchecked—damage. The end result can be oxidative damage. Now, back to that car. Let that car sit out in the elements for days, months, years on end with continuous exposure to the elements i.e. rain, heat, cold… With time, what once was a beautiful, shiny car is now a disfigured, rusty image of its former self. Open the door and hear the creep and crack of what once silence and smooth movement. Insert the key and turn to hear the sputter, delayed turnover of what once was a crisp, clear ignition start. What was once a gentle hum that calmed the soul, is now a loud, chaotic noise disrupts the soul. Push the gas pedal to find a delayed, sub-optimal gas injection and movement where once a horse-power dream existed. That is the effects of the oxidative process on a car. The most visible evidence of this process is better known as rust. What does rust have to do with cancer? Rust is the interaction of the oxidative process (oxygen) with iron. Iron exists in the imagery of the car above as it exists in the body. In the imagery above, the oxidative process is with the car. However, in cancer, the oxidative process is with the cancer cell. Whether it is on the body of the car or in the body or cell of a person, the effects of oxidation are the same—damage, visibly evident as rust. What is an antioxidant? An antioxidant is simply something that is anti-oxidation. An antioxidant is something that counters the potential destructive oxidative process. An Antioxidant, whether on the body of the car or inside the body or cell of a person, is anti-rust. 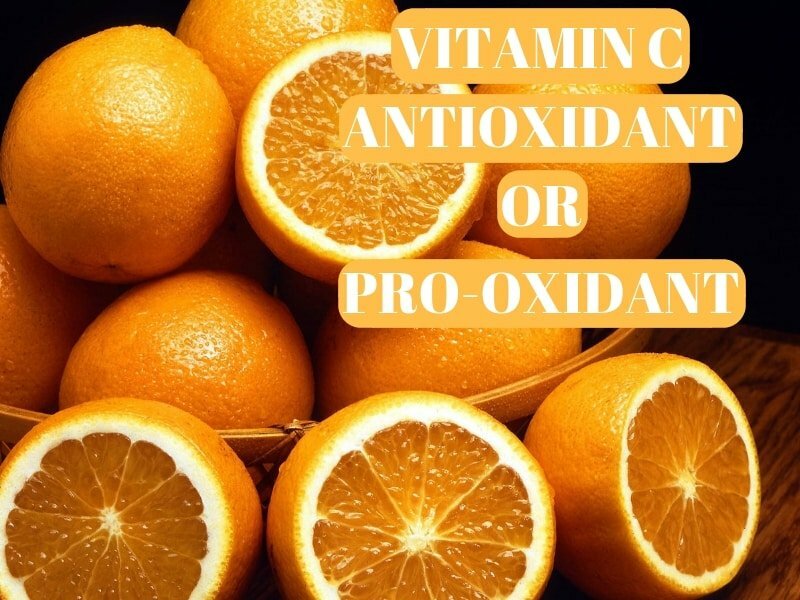 Some common antioxidants are vitamin E, beta-carotene, Quercetin… The most famous and powerful antioxidant is vitamin C.
How can vitamin C be both an antioxidant and a pro-oxidant? This is a question and yet a true statement at the same time that confounds many cancer doctors today. As I stated previously, the environment dictates the response. Vitamin C, especially at the higher dosages, that can be obtained only through IV vitamin C delivery, has been shown to be a potent pro-oxidant (not an antioxidant) in cancer cells. The baseline level of ROS in the cancer cell is already elevated. The high metabolic requirement to meet the high growth present in cancer appears to be the primary cause of this increase in base-line ROS. It is the pro-oxidant activity of vitamin C in cancer cells that generate the required increase in the levels of ROS, such as H2O2, OH−, ·O2−, to then kill cancer cells. The H2O2 works more like a messenger that ends in oxidation with OH− and ·O2−, rather than the end cause of oxidation. 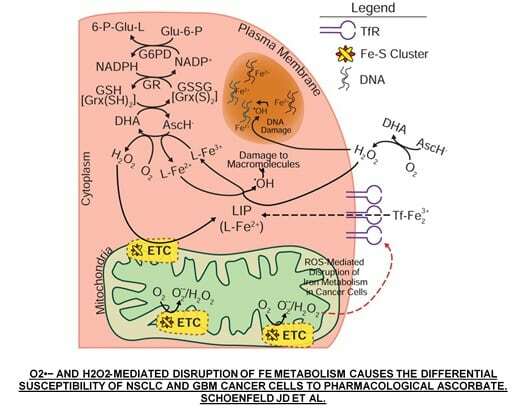 In the presence of this high ROS, cancer cells carry a high labile iron pool due to an increase in iron transport into the cancer cell and a decrease in the transport of iron out of the cancer cell. The therapeutic vitamin C is converted to the oxidative H2O2 messenger outside the cancer cell and then transported inside the cancer cell to then interact with the high labile iron pool to create the oxidative stress, deplete the glutathione pool in the cancer cell and cause oxidative damage— again, think cellular rust. 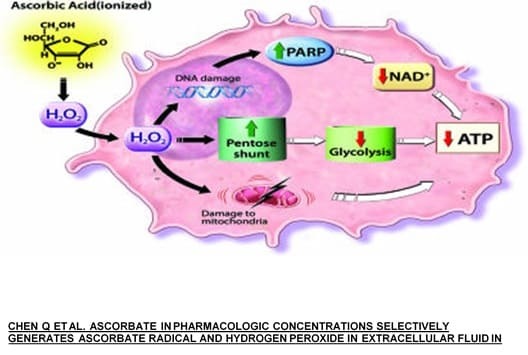 This intra-cellular process of oxidative stress and oxidative damage begins the death spiral within the cancer cell which triggers cell death (apoptosis). In addition, Reactive Nitrogen Species (RNS) via Nitric Oxide (NO), can also play a part in the oxidative process. Where there is iron, whether on the body of the car or in the body of the person, oxygen will interact with it to create rust, oxidative stress, and potentially oxidative damage. The key factor that separates cancer cells from healthy cells is that cancer cells lack the appropriate levels of certain enzymes, such as catalase and glutathione peroxidase, to counter these high ROS levels through the reduction of oxidative stress and a decrease in the oxidative damage potential. This appears to be only true about cancer cells that lack stem activity. We will discuss this at a later post: the difference in ROS in cancer cells without stem activity versus cancer stem cells. Healthy cells, that is non-cancer cells, retain appropriate catalase and glutathione peroxidase activity and are thus perfectly capable of reducing the high ROS levels, prevent oxidative stress and the associated potential oxidative damage. Vitamin C, thus, functions as an anti-oxidant in healthy cells but as a pro-oxidant in cancer cells, as dictated by the environment. The story for vitamin C does not end there. Vitamin C also behaves as an inhibitor of the glycolysis pathway (see image below). Glycolysis is a key pathway in the cell cycle of energy production and the primary mechanism of energy production in cancer cells. Vitamin C targets and blocks the activity of Glyceraldehyde 3-phosphate dehydrogenase (GAPDH), a key enzyme in glycolysis. This blockade of the GAPDH enzyme shuts down a cancer cells favorite way to make energy. Is vitamin C an antioxidant or a pro-oxidant? Yes. Vitamin C can be a pro-oxidant in cancer cells and yet can be an anti-oxidant in healthy cells at the same time. They are cells, yes! But, the environment of these cells are different in every way. They are different in their environment, different in cell metabolism, different in redox potential, different in detoxification potential, different in antioxidant and pro-oxidant potential… In fact, you can say the same about cancer cells that lack stem activity in comparison to cancer stem cells, but that is for another time and in another post. The functions highlighted above make vitamin C a potent anti-cancer therapy that leaves healthy cells unharmed. A therapy that attacks cancer and heals the body at the same time—what a great combination and a novel concept! Now you are informed.